THE BONE-CRUSHING bite of Tyrannosaurus Rex was like no other, according to a study released this week that solidifies the fabled carnivore’s reputation as the most fearsome of dinosaurs. T Rex could not only crack the biggest of bones, it could also pulverise and ingest them, absorbing marrow and minerals beyond the reach of less well-endowed competitors, researchers reported. 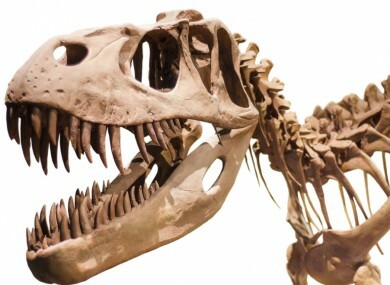 “The combination of impressive bite force and stout teeth set T Rex apart,” lead author Paul Gignac, an assistant professor at Oklahoma State University, told AFP. Gignac and Gregory Erickson from Florida State University built on earlier attempts to measure T Rex’s bite force by adding comparisons with predators roaming the wild today. Wolves and hyenas, for example, are also able to crush bones with their teeth, accessing nutritious marrow. Their secret? So-called occluding teeth that fit together perfectly, top-and-bottom, a feature common in carnivorous mammals. T Rex lacked such dental gear, raising the question of how they managed to shatter resistant bones the size of small tree trunks. “Without occlusion, it is typical for food items to rotate and shift as teeth are being engaged,” making it difficult to get a firm grasp, said Gignac. To be sure, sheer power counts for something. The study found that T Rex’s jaw exerted a crushing 3.6 tonnes of force, equivalent to the weight of three mid-sized cars. Even more impressive, the dinosaur’s tooth pressure, a new metric devised by the researchers, was even greater: an astounding 30 tonnes per square centimetre (431,000 pounds per square inch) of dental surface. But even that may not have been enough to get the job done, the study found. Saltwater crocodiles, the world’s largest living reptiles, exert nearly as much pressure despite their much smaller size. They use that power, however, to capture not chew their prey, swallowing them whole instead. The difference is that T Rex, even if it lacked occluding teeth, still have the necessary equipment to make short work of bones. “It had extraordinarily large, conical and strongly rooted teeth that were replaced after being worn every couple of years,” Gignac explained. The findings, reported in the journal Scientific Reports, show that “sophisticated feeding systems more commonly associated with modern mammals also appeared during the Age of Dinosaurs,” he added. Interestingly, the limit to T Rex’s bite force was probably not muscular, but the capacity of its teeth to withstand such intense stress. Crocodiles and T Rex ”are probably operating at tooth pressures that are nearing the extreme structural limits of what reptilian tooth enamel can handle,” Gignac said. T Rex’s grip, in other words, may be just what is needed to fracture bones. Any more might have caused irreparable damage to the king’s pearly whites. Email “Tyrannosaurus Rex was able to pulverise bones with its teeth”. Feedback on “Tyrannosaurus Rex was able to pulverise bones with its teeth”.